My friends and I are seven hours into our 24-hour marathon. No one's gotten on anyone's nerves yet. That's because, for now, we've all split up. I needed to take a blog break and find a place to recharge the iPad and iPhone. The covered payphones on Big Thunder Trail are a fine location. I especially appreciate the large bench. It's crowded at Disneyland today, but not painfully so. It does feel more like a weekend or summer crowd, though. Certainly not a Wednesday in February. 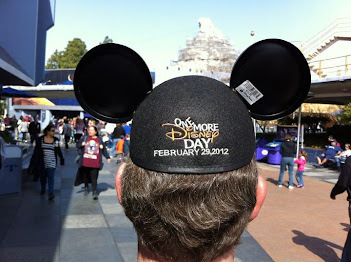 "One More Disney Day" merchandise has been moving at a steady clip. At Star Trader in Tomorrowland, they were already sold out of small- and medium-sized commemorative t-shirts. I was able to snag a set of mouse ears. I'm happy with my selection. That was two hours ago, though, I can't say they're still available. They were selling fast. Sugar and caffeine remains my friend. There was virtually no line for Dole Whips in front of the Tiki Room. This is rare on any Disney day, so I indulged myself. 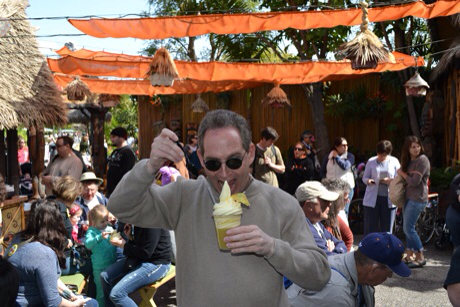 I'm either about to devour this Dole Whip float, or stuff it up my nose. You be the judge. We're hitting rides at an easy pace. Big Thunder Mountain Railroad and the Tiki Room have been checked off. I even took some time to hang out with a group of MiceChatters in the hub for a noon meet. Seventeen hours to go. I got this.